last week headed to a cocktail party with the always wonderful Mandy and Duyen (thanks Marc for trusting me with your Leica) to kickoff lemonade day this past weekend (i hope everyone helped support the kiddos by purchasing lots of lemonade!!) The party was hosted by the amazing and beautiful Lisa Holthouse, at her equally amazing and beautiful home! She co-founded Prepared 4 Life which is leading the charge for Lemonade Day here in Houston. Upon arrival, we were handed a glass of Veuve for the trek from the valet to the home. I had much anticipation leading up to the view of the home. AMAZE. Impeccably decorated, with a mini Fendi boutique at our fingertips along with more libations. 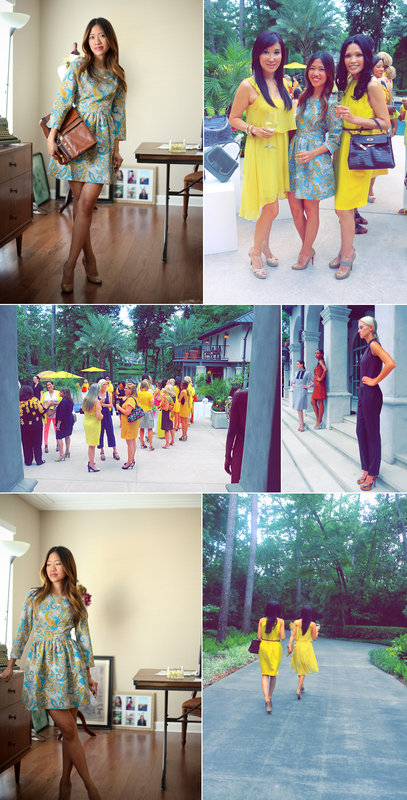 The guests were encouraged to wear yellow as we all mingled in the back of the home. Great cause, great event. what a fun event! take me with you next time! btw you look great! haha thanks!! if i can get invited and bring a guest i will definitely! issa i LOVE THIS DRESS! i saw it at H&M the other week. i wanted it but they didn't have my size. Love your dress, 'nuf said... so sorry about computer problems and could not send you all the pix. Next time I just burn you a CD and post it, it would have been faster... lol.